We appreciate your interest in our inventory, and apologize we do not have model details displaying on the website at this time. Please fill the form out below and our team will quickly respond, or, please call us at 888-436-3216 for more information. The 2015 Ram Promaster Conversion Van is truly contemporary in terms of handling, flexibility, and affordable ownership costs. This has made it an obvious choice for conversion. The Promaster Van doesn’t look like a traditional commercial vehicle. It has a nose-down front with nips, tucks, and lines that reduce wind resistances. The trim shape makes it easier to handle and easier to maneuver in tight spaces. The Promaster boasts a Best-in-Class Turning Circle. Built for toughness and durability, it can tow up to 5,100 pounds. In many ways, the interior doesn’t reflect the trim size. The largest Promaster has a total cargo rating of 4,430 pounds, which makes it a good choice for any type of customization. It is certainly sturdy enough to handle passengers and their luggage. The van offers room to spare even when outfitted with specialized chairs and equipment. 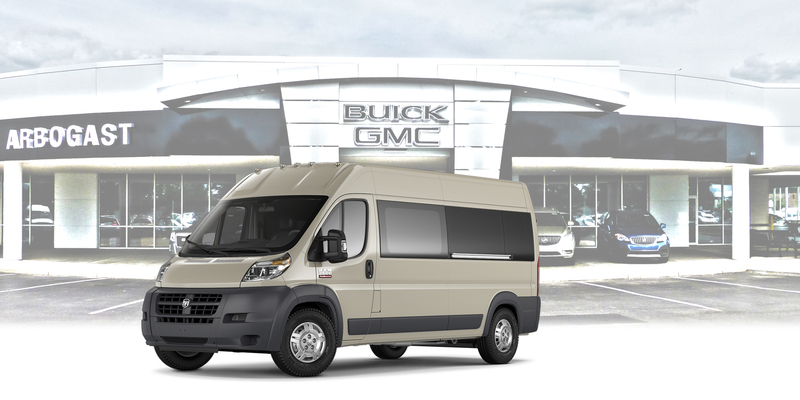 Since it was designed with conversion in mind, the Ram ProMaster lends itself to business or family customization. For businesses, there are limo-like layouts to accommodate passengers without a sedan’s limitations on headroom and legroom. Large, swiveling captain’s chairs and a sofa-like rear seat offer a quiet place for customers to relax between appointments or tourist spots. For families, it offers the ultimate home away from home. Comfort features include reclining, sliding, and power-adjustments. Overhead, a large television turns the cabin into an entertainment zone. With its special engineering to reduce cabin vibrations, the Promaster offers a smooth, quiet ride that can make a long trip more enjoyable. The size isn’t the only reason that this Ram offers an easier driving experience. This smart commercial vehicle has front-wheel drive. A V6 engine offers Best-in-Class capability to keep the van competitive at highway speeds. The automatic transmission is calibrated for extra torque when the load gets heavy. Advanced traction controls keep the vehicle stable even when the road is wet, steep, or curvy. Like a minivan, the Ram Promaster has four frontal airbags and two long air curtains. It also has Brembo brakes to ensure safer stops. Brake Assist offers a boost during emergencies. Trailer sway damping alters handling to match the needs of a heavier load. The Ram Promaster Conversion Van is backed by Ram’s three-year general warranty and a five-year powertrain warranty. Coverage includes up to five years of free roadside assistance. The aerodynamic, trimmer body keeps fuel costs low. The 24-gallon tank lets the driver cover more of the road with fewer stops. With the arrival of the Ram ProMaster, this is a good time to choose conversion for your business use or personal pleasure.